Ashes started out as our first foster kittie. She had a hard start in life. 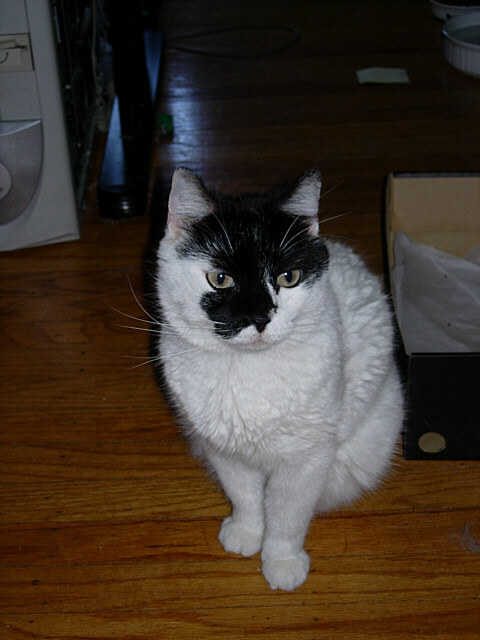 She came into the Stray Cat Blues organization after she was found comatose in a burned out building in Philadelphia. She was pregnant, and spent two weeks in intensive care. After coming around, she was blind for a while, but got better. After having her kittens and raising them, it was her turn to be adopted. She was in the PetsMart adoption center for two months, and it was getting to her. She needed to be put in a foster home for some personalized love and attention. However, we found that she had some health problems. She had an ear infection, and some growths on her face that turned out to be cancer. It took a while, but she made a full recovery. By that time, she had become my lap cat, and I didn't have the heart to adopt her out. So we became her "forever home". An interesting note is that she like men, but not women. She's cold to my wife, Caroline, and other women who come into the house. She'll cuddle up to men, however. Ashes and Cautious hate each other, to the point of fight-to-the-death. We have the vet bills to prove it. Trying to keep cats who live in the same house apart makes for some intersting times. I actually have quite a few nice shots of Ashes, but don't know where they are right now. I'll try to get them up later.